Paris is renowned for its numerous monuments, galleries, and museums. It is also known for its exuberant styles of art and architecture. Moulin Rouge is a well-known cabaret situated in Paris and was co-founded by Charles Zidler and Joseph Oller all the way back in 1889. The name translates to Red Mill, and true to its name, it continues to have a red windmill on its roof. Currently, it is a tourist attraction and entertains visitors from across the world. Over 60 artists from around the globe perform a series of breathtaking acts, from acrobatics to the brisk French Cancan! The show at Moulin Rouge is a confluence of numerous dance styles and music. 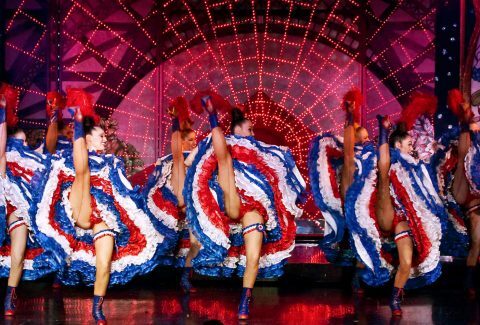 For nearly two hours, you will see a vast range of scenes unfold before your eyes, including the French Cancan, a famous Parisian cabaret dance. You will also have the chance to enjoy half a bottle of champagne as you witness the breathtaking show that consists of flamboyant colors, original productions, and talented artists. Over 1000 different costumes in vivid combinations can be seen on stage, making the Moulin Rouge a spectacle that cannot be missed! The ticket also allows you to get on board a Bateaux Parisiens boat and enjoy a calming cruise over the Seine. During the one-hour cruise, you will discover the beauty of Paris, albeit from a new perspective. With an audioguide available in several languages, you can learn the history of some of the famed monuments such as the Louvre Museum, the Conciergerie, the Eiffel Tower and the Notre Dame. In the end, you will have had a comprehensive tour of Paris’ best-known attractions. The show runs from Monday to Sunday at 11 PM and ends at 1 AM. From April to September, the departure times are every 30 minutes between 10 AM and 10:30 PM (Except at 1 PM and 7:30 PM). From June to August, the cruise runs every day of the week between 10 AM and 11 PM. From October to March the cruises depart once every hour between 10:30 AM and 10 PM (Except at 1 PM and 7:30 PM). Guests must dress elegantly. Please refrain from wearing shorts, jeans, or tennis shoes. There is a mandatory paying cloakroom at the Moulin Rouge show. You will receive an email confirmation with your Moulin Rouge Show & Seine River Cruise voucher shortly. Please download and display your voucher on your mobile phone along with a valid photo ID at the Paris City Vision's office, in exchange for your physical tickets to the Moulin Rouge and Seine River Cruise. You may then proceed to the Moulin Rouge. PARISCityVISION, 2 rue des Pyramides 75001, Paris. By Bus: Get off at stop Pyramides - Tuileries using buses 72, N11 and N24 or at Pyramides - Saint-Honore using bus 68. By Subway: Get off at Tuileries using line 1. You must make your way to Moulin Rouge. Moulin Rouge 82 Boulevard de Clichy 75018 Paris. You must make your way to Bateaux Parisiens, Port de la Bourdonnais, 75007 Paris, France, Paris. The Seine River Cruise ticket is valid for one year from the date of booking. The Moulin Rouge ticket is only valid for the date and time of the booking. Best price, best availability, no hidden fees and exclusive Tickets.co.uk special offers! Tickets.co.uk is your one-stop shop for tickets. Book safely and securely with Tickets.co.uk, an official, recognised and trusted source.